I will be cooking fresh Bucatinni with fresh steamed cut up quahogs and Ro-Tel tomatoes. Cleaning those quahogs is a nasty job. I think from now on I am going to stick to just clams. Less work. Sounds yummy, Addie. I have to cook the steelhead trout I meant to eat yesterday. Expecting a thunderstorm--hopefully that will break the humidity enough to tempt me to cook. I don't have much of an appetite when it is so frigging hot and humid. Tonight i'm making Hamburger Onion pie. It's a delicious dinner with plenty of leftovers that tastes even better reheated another day, or even after freezing. We've had the threat of rain flying by us to the west all afternoon. "Nice" and sticky outside, too, with 98% humidity outside my air conditioned home. I'll cook inside. Ham steaks seared in my CI pan, then joined by fresh green beans and a bit of water so they soak up some of that lovely smoked ham flavor. Fresh corn off the cob, too. And a using-up-some-greens salad before the main event. We're having BLTs tonight along with some fresh corn off the cob. Sounds good, Addie. Glad to see you participating in the daily dinner thread. Hope to see a pic of your great sounding dinner! I'm going to have an Ortega burger. I saw them on the menu when we were out of town over the weekend, and it sparked my memory of how good they are. Fire roasted whole Ortega green chiles and a slice of Monterey jack cheese on a grilled burger, with tomato and sliced red onion on a toasted bun. A very simple summer supper. Part of a green bell pepper sliced into rings and stacked. Fill the hole with cottage cheese and surround with cucumber slices and halved baby tomatoes for scooping and green and kalamata olives. Top with a minced scallion and a whole lot of black pepper. Big slice of watermelon and an icy beer mug of ice tea. I think I get double points -- no cooking involved. Dinner on the deck tonight. 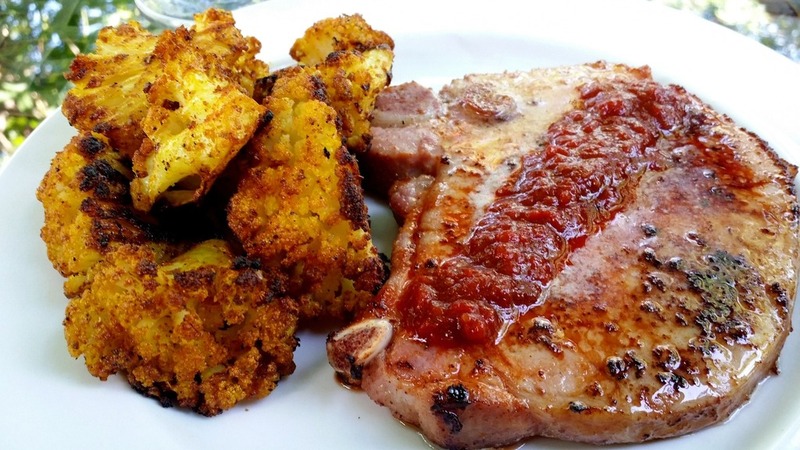 Smoked poke chops with salsa roja and spicy oven roasted cauliflower. Served with a nice chilled sauvignon blanc we picked up in Santa Barbara last month.